Finally, 17 days since PACT’s departure from Rocky Mountain House, it is time to hear from the crew members…. The other day at the Historic Site of Fort Pit, I was sitting in the field, enjoying one of the long spring/summer sunsets. I was thinking about the place, the river we have been traveling on. And about the stories that have been written about this historic fur-trading route, and about the stories that we are currently writing. Fort Pit has these structures laid out to help paint the picture of the people who once lived there and what once stood at this site, giving those who visit a sense of place. Although we have Peter’s historic anecdotes, not every place that we will visit will have spaces dedicated to remembering. It is sometimes easy for me to forget the people and animals that, simultaneously or previously, have traveled this same route. There is so much history and happenings in the spaces that we are passing through. My new challenge from this point on is to really take the time to observe my surroundings and listen to the stories they have to tell. The beginning of this trip has been a really wonderful journey. I am slowly becoming more comfortable and more in tune. There is much to say about these past two weeks, but I am happy, sun/wind burnt, and the spirits are high! This sort of canoe trip is brand new for all of us. The sites are not set and our path is undiscovered. Focusing on the journey rather than the destination is always something campers try to do - but it becomes especially important when the destination is four months away. With that in mind, we’ve done our best to keep the ride spicy. We’re all together in a single boat. More people means more stories to be giggled at and perspectives to be thrown out there. The chats come and go, but when it's on, we really make some magic. Thanks to the knowledge of the rest of the crew, I have now reached the point where I feel comfortable writing a Grade 7 level science test. If you have time, I suggest 'Googling' solar systems. I’m not sure if I’m buying this whole ‘sun is just one of many giant stars’ thing, but there is some fascinating stuff going on up there. Our talks can be fun and light at times, but heavy and thought provoking at others. Two weeks deep I am happy to report that we are keeping ourselves entertained and enjoying our time on the water. Wes, an employee at the Rocky Mountain House Historical Site, posed this question to me on the morning of our departure. I didn’t hesitate with my response. I grew up playing in the woods, swamping, hiking, camping, canoeing and exploring outside. ‘Nature’ was my response. Moose, deer, ducks, wolves, geese, beavers, eagles, pelicans, bears and more have been spotted from our voyageur vessel thus far. 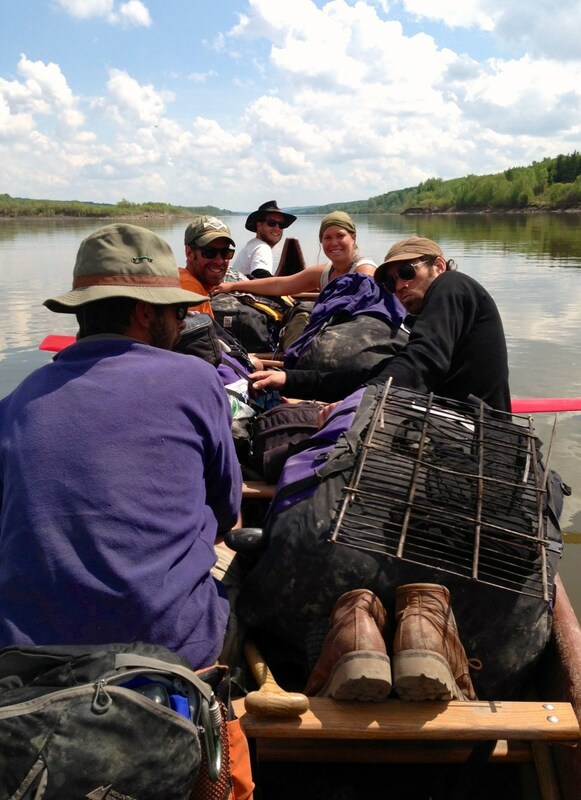 We have paddled past cliffs, fields, forests, rolling hills and prairie flats. Everyday we wake from our tents to paddle the water and then set up our new life in the woods for the night. And everyday I am so excited to fall asleep and do it all again tomorrow. Every few days we paddle through small towns, and sometimes we reach larger places where we stop for a break or to find some treats for the trip. We have been welcomed by some of the most friendly people I have ever met; I am amazed by the generosity and kindness they have shown us. I am so grateful that we have taken the time to stop, talk, and get to know people who are interested in our journey. You may have read about Uncle Bob and his ranch. I enjoyed getting to know the locals of this small town and was humbled by the gifts they offered us. Yesterday we spent the afternoon in North Battleford where we met a couple that were so excited about our trip, that they rounded up the family to see us off down the river. We also met a lady who ran a non-profit business in the community and offered us a ride down to the water, since it was a long walk into town. These incredible people have made my personal highlight reel for the beginning of our trip. I am excited to continue experiencing unique communities, sharing stories and creating memories with fascinating people. After two weeks of paddling, everything is going smoothly, and happening fast. Planning an expedition of this nature required and still requires a tremendous amount of logistics. Route, resupply, equipment, safety, fundraising, sponsors, and media require attention. Marc spoke to this previously as the “Adventure leading up to the Adventure”. After such a long planning and anticipation time leading up to our departure, it is the most satisfying feeling to be paddling our canoe with the present company. I am constantly in awe of the landscape, the weather, the wildlife, the people, and our crew. We are off to a strong start and getting stronger. Now having started the adventure, I am grateful to be in the ‘doing’ phase. Three days ago we left our grill at a campsite. As far as gear goes, it wasn’t the worst thing to lose. It’s not quite the same as misplacing all the tent pegs or accidentally leaving Marc behind, but having a grill definitely makes cooking a lot more enjoyable. As we pulled into North Battleford yesterday, getting a new grill was high on our list. But where do you buy a camp grill in a small town you’ve never been to before? Come to think of it, where does anybody buy a camp grill? They’re always just around when you need them. No one ever seems to remember actually buying one. So it was no surprise that amongst Battleford’s stores and markets we couldn’t find one. Later, as we were heading back to the river, I was standing on a downtown street corner trying to remember which way to go when I looked down at my feet and, no word of a lie, I was standing right on top of a grill. This has never happened before - I have never in my life found a camp grill on a street corner. It doesn’t belong there, it belongs on a campsite. Yet here was the exact item we needed, lying on a street corner at the exact time we needed it. I’m not sure who to thank or how to repay this favour, or even the astronomical odds of something like this happening, but we’ll all paddle on while luck is on our side and hopefully things will just keep going our way.